I am writing this article today because I would like to share some of my experiences with this dog food. So far, I consider this food a good choice for my Cane Corsos, besides raw and cooked meats. I am rating this dog food my second favorite only to what most of my dogs are eating Lifes Abundance. In my opinion fresh meats cooked and served to you dog with rice(optional) will beat any dog food. Since not all of us can cook every meal for our dogs I tried to find a dog food that can come close to a good home cooked meal. I chose the Wysong brand. 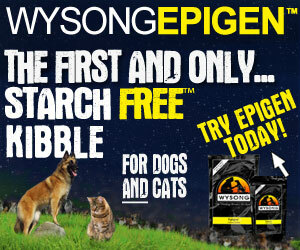 Wysong Epigen is a ‘grain free’ and ‘starch free’ dog food. It works well for my dogs, however, you may differ in opinion. I have yet to feed this food to my Cane Corso puppies. All I can say is try different dog foods until you get the one that produces the best results for your dog. One thing I liked from the start is, the second main ingredient is ‘organic chicken’. I feel if we can get organic meat for ourselves and our pets it’s well worth it. I have researched the many methods used to process organic chickens and non organic conventional chickens and it is very different. Chlorine is used in the processing of the chicken as well as many antibiotics. If you research, you will see many countries have decreased the importation of chicken into their country from the USA in the last five years. Some do so because of bird flu, a common illness that is facilitated by the harsh conditions that chickens are exposed to, while others do not agree with the conditions or the chlorine used in processing. Why do you hear so many cases of dogs getting cancer like humans? Well if they both eat junk, do you think this may contribute? I do! I talk to my friends often who lives in Europe. They are some of the most famous Cane Corso breeders in the world, many tell me its very rare to hear of a dog in Italy with Cancer of Hip problems. Many dog owners, often tell me their last dog died of cancer…. it seems like an epidemic. This does not mean that eating organic food will be a guarantee your dog will not get cancer, however, a better diet will keep the immune system healthy and the risk of cancer may decline. I am happy with my Wysong Epigen so far, however I only feed this to one of my dogs (Princess) since she seems like this food, On the other hand the rest of my dogs are eating Lifes Abundance grain free, and seem to prefer it over Wysong. The product I used is called EPIGEN. It was cheaper for me to order it from the Internet than at my local store. I chose this food, because I did not have time to boil chicken for every meal to feed my dogs. I felt like my full time job was being a chef to my dogs! I found EPIGEN when I searched for a ‘no grain’ dog food with ‘no starch’. Many think all the digestive issues of their dogs will go away when they buy a good grain free dog food. I agree that grain free is very good, however, I must tell you starch free is better. Fact is, if a dog food is 22% Protein for example like Costco’s Kirkland Natures domain Turkey, you must wonder what is the rest of the food if the fat content is under 10%? At one time I was feed my dogs Natures Domain, until I did a little more research on Diamond Pet Foods maker of Natures Domain for Costco just too many recalls. See this link for Diamond pet food reviews, and you will see. I also notice some slight stool issues on one of my dogs. This stools are much better now that I have them eating lifes abundance no grain and they have never had any recalls. With some grain free foods like natures domain the protein level is low, which means there is more starch, this is not the case with Life’s Abundance. Sweet Potatoes contain lots of starch and natural sugars which are not bad like wheat and corn, however, the digestive issues may be seen with too much starch in high doses. We know probiotics will help dogs and humans to build the natural floral in their digestive track, but dogs do not digest starches in general. If you switch your dog to a grain free dog food and his stool is still too soft, then this may be the case. The causes of digestive disorders many times are caused by previous dosages of antibiotics that have depleted the natural flora. Did you know one 10 day dose of antibiotics is enough to knock the natural flora out of a dog in a big way. I have read in lots of research it can take up to six months of treating with probiotics to replace the damage. Six Months!!!!! Thats crazy! so what if you do not give your dog probiotics then what??? Well you may end up with a stomach disorder that can turn into something else……Ok lets get back to the dog food.. Ingredients: Organic chicken, chicken meal, turkey meal, potato protein, meat protein isolate, chicken fat, gelatin, dried plain beet pulp, natural flavor, coconut oil, chia seeds, salt, calcium carbonate, tomato pomace, calcium propionate, taurine, choline chloride, organic barley grass powder, blueberry, dried kelp, yogurt (whey, milk solids, yogurt cultures), apple pectin, fish oil, yeast extract, citric acid, chicory root, hemicellulose extract, mixed tocopherols, rosemary extract, yeast culture, carrots, celery, parsley, lettuce, watercress, spinach, minerals (potassium chloride, zinc proteinate, zinc sulfate, ferrous sulfate, iron proteinate, copper sulfate, copper proteinate, manganese sulfate, manganese proteinate, sodium selenite, calcium iodate), vitamins (ascorbic acid [source of vitamin C], vitamin E supplement, niacin supplement, calcium pantothenate, vitamin A supplement, thiamine mononitrate, pyridoxine hydrochloride, riboflavin supplement, vitamin D3 supplement, biotin, vitamin B12 supplement, folic acid), dried Bacillus licheniformis fermentation product, dried Aspergillus oryzae fermentation product, dried Aspergillus niger fermentation product, dried Enterococcus faecium fermentation product, dried Lactobacillus casei fermentation product, dried Lactobacillus acidophilus fermentation product, dried Bacillus subtilis fermentation product, dried Lactobacillus plantarum fermentation product, dried Lactobacillus lactis fermentation product, pepper. Notes: You will see the the fourth ingredient is potato protein, this is the dry residue remaining after removing the starchy part of a potato, so it is not the starch. The fat-to-protein ratio of about 20%. Protein is above average and fat is a little below average. Here is what I think is also important. Studies show that a ‘high carb’ and ‘high calorie’ diet in puppy mastiffs can contribute to bone issues, this dog food has below-average carbs when compared to a typical dry dog food. Even without the protein-boosting effect of the potato protein and chia seed, the profile of this dry dog food contains a plethora of meat. Wysong has a special process they use to bind their dog food, this allows them to stay away from the starch that is used to bind kibble. If you ever made a potato pattie or potato crocket you will see it binds together nice …why? because of the starch. Most dry dog foods have a protein content less than 40% for this reason since they must bind the kibble together with starch and the more starch the cheaper it is to produce for the manufacturer. But Wysong claims 60% meat. I calculated this should put the carbs at about 13% which is VERY good! So the bottom line is while I feel Wysong is the best dog food for my Cane Corsos, it comes at a price, this dog food is nearly $3.00 per pound, you will find it cheaper to go out and just buy organic chicken and boil it, however if your not ready to do this then this is a good food. At the moment most of my dogs are on Life’s abundance and this comes out to less than $2.00 per pound. Thank you very much for this article. So what do you feed your puppies? Thank You for another great article! I have learned a lot from your website. I wish my breeder would at least answer my calls. My next corso will be from you! Keep on working, great job! I love reading your articles on cane corsos!